Status: Ships in about a week. MEDICAL DEVICE AUTHORIZATION (MDA) Purchase of some medical devices require users to have the supervision of a medical practitioner, these devices may be labeled "Caution" or "RX only". Ensuring medical supervision and/or authorization is the sole responsibility of the purchaser. 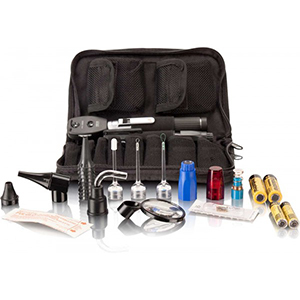 The Deluxe Field Corpsman Kit from NAR is a lightweight, durable and portable diagnostic kit providing excellent performance and flexibility in the field. 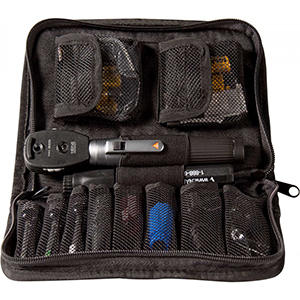 This waterproof and highly durable kit includes a variety of high intensity lights and magnifiers for day or night examinations, as well as an Ophthalmoscope. We are a proud full-line North American Rescue dealer. If you can't find what you are looking for, please contact us. We can get what you need.